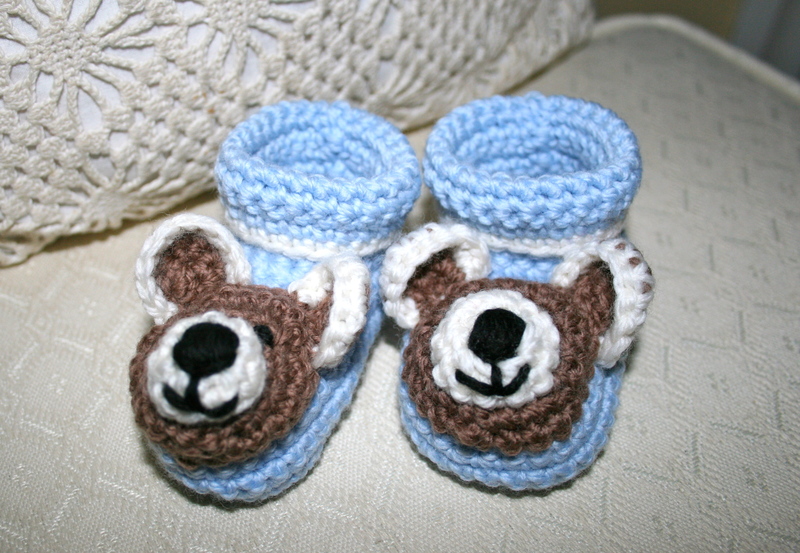 Here at last, these cute little crochet baby shoes, I just adore the teddy bear faces on them. They were really fun to make, well maybe a bit fiddly when it came to making the ears, but they are worth a bit of faffing wouldn’t you say? 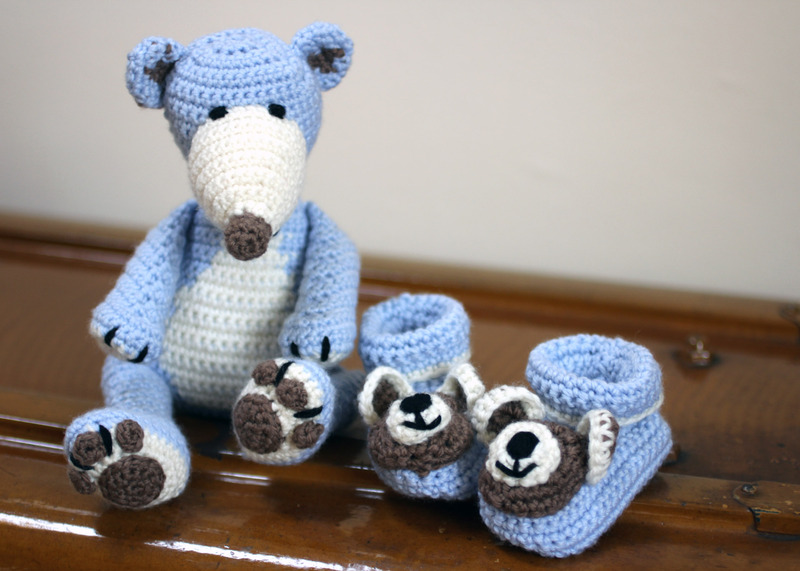 You may remember I told you back in August about my colleague NG who was expecting her second child when I wrote about the Teddy Bear (thegrangerange.wordpress.com/2012/08/15/teddy-bear-for-a-baby-boy-from-lois-daykins-baby-crochet-book/). Well the expected little man has made his entrance to the world and is now the grand old age of 2 weeks. NG and son number one, Master R, brought Baby S into the office last week to see us, so sweet, so little, so sleepy. Big brother Master R, was so excited as he proudly introduced little Baby S as my new sister! Well, he is only three and a half himself, bless. 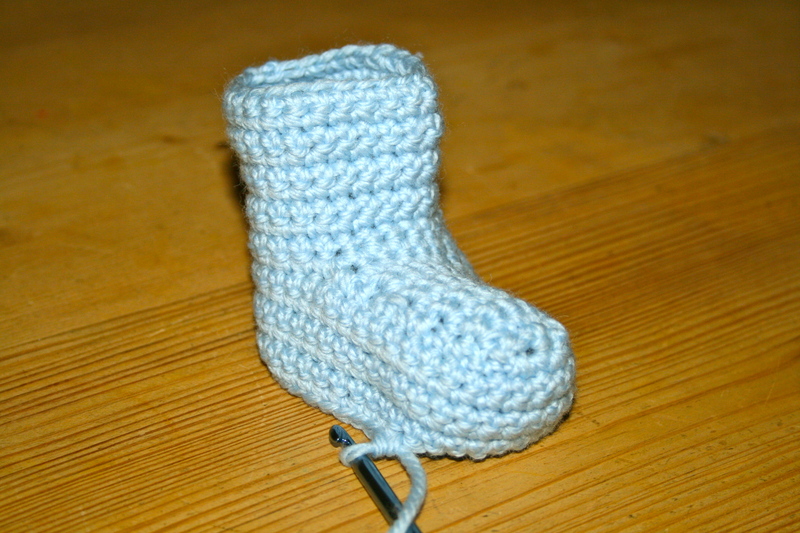 Anyway back to these lovely little baby boots. I used the same as for the Teddy, Rico Soft Essentials Merino Aran from www.crafty-yarn.co.uk/shop/115/175/index.htm the delicate pale blue for the main bootee colour with beige for the face and paws and a touch of cream for the finishing touches. I am definitely intrigued by baby shoes, you see so many fabulous designs from cute Baby Jane shoes to mock Wellies, Converse baseball styled boots and trainers. I was a bit confused at first as other shoes that I have made have always started with the sole and worked up but with these you start at the top. 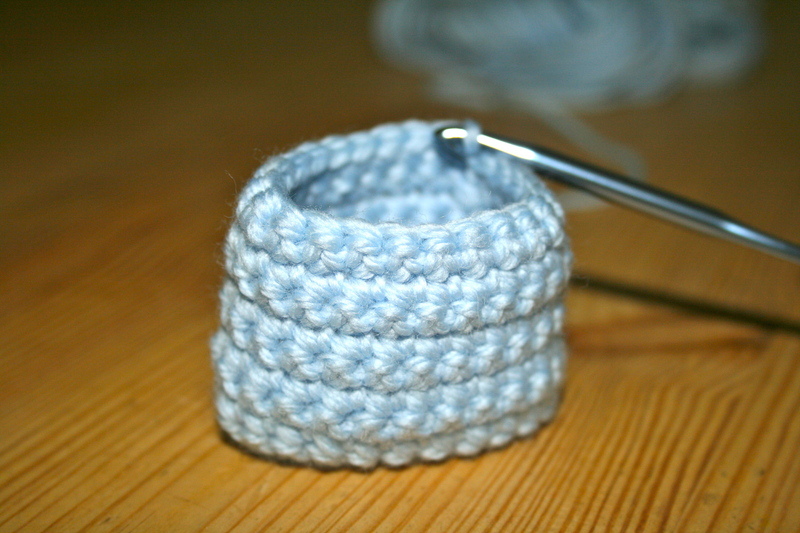 By making a chain and joining to form a circle then working in rounds you create the boot cuff. Then you add the top of the boot, it looks like a big blue tongue at this stage. Then you pick up and work in rounds again the form the sides, heel and toe. That leaves the sole to do. 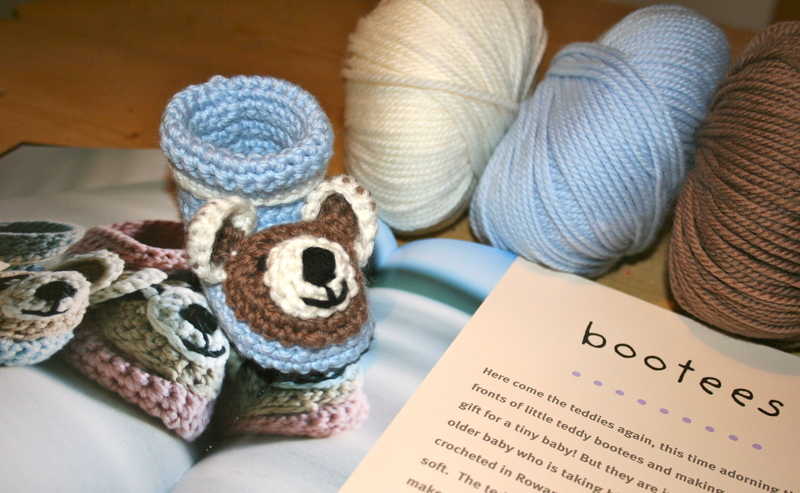 So with the sole completed and a line of cream trim around the top of the bootee it’s time to make the sweetest of Teddy Bear faces, their cuteness being the essential element for these baby feet treats. Finally stitch the face onto the bootee, I actually applied the features before stitching on the face as it was easier to manage and gave a neat finish as any ends were tucked away. Make another one to match and you have the cutest little Teddy Bear Bootees fit for a prince, or in this case Baby S.
This is my favourite photo of both Teddy and Booties taken by my lovely friend and photographer Liv, you can probably tell that she also took the image of the boots at the start of this post. I do my best with the photography but find it quite trying at times as I get shadows and dark patches or cannot get the composition to look on the image the way I had envisaged it in my head. I was struggling with this image when Liv just happened to pop round and quick as a flash (pardon the pun) it is done. You can see more of Liv’s work on her website www.livcawston.co.uk . Thank you Liv. 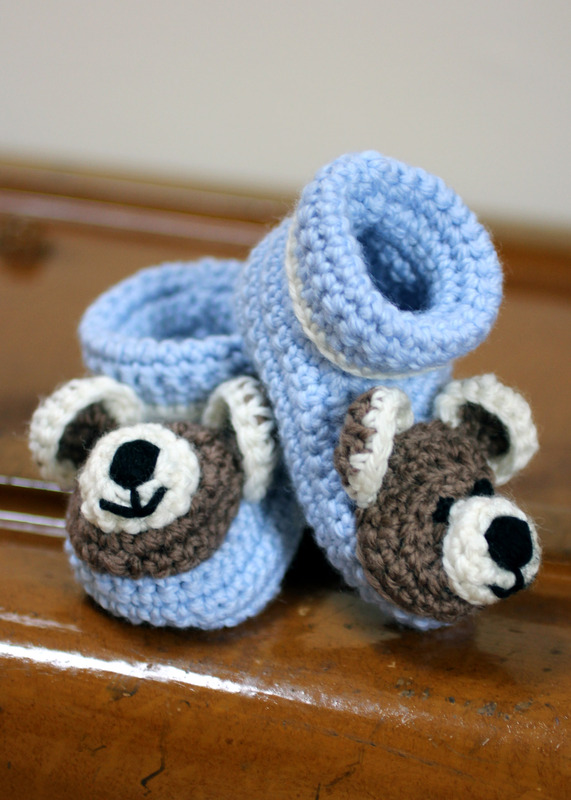 Could you please send me the oattern for the teddy bear booties ? The pattern is from a book titled Baby Crochet by Lois Daykin. There is a link at the bottom of the post that will take you to the Amazon page, I can recommend the book as there are some lovely patterns to make. They are one of my favourites, I have made them a couple of times. Where can I download this pattern? It’s the cutest pair I’ve seen. Thank you, they are so cute that I have made them a few times now. They are from a pattern book by Lois Daykin called 20 Hand Crochet Desidns for Babies available here http://www.amazon.co.uk/Baby-Crochet-Designs-Babies-Months/dp/1904485871 I bought a used copy and it was great hardly used at all. Hope you enjoy, don’t forget to post them if you make them, I would love to see. Oh how lovely, baby clothes are so much fun to make. Such a cute idea! 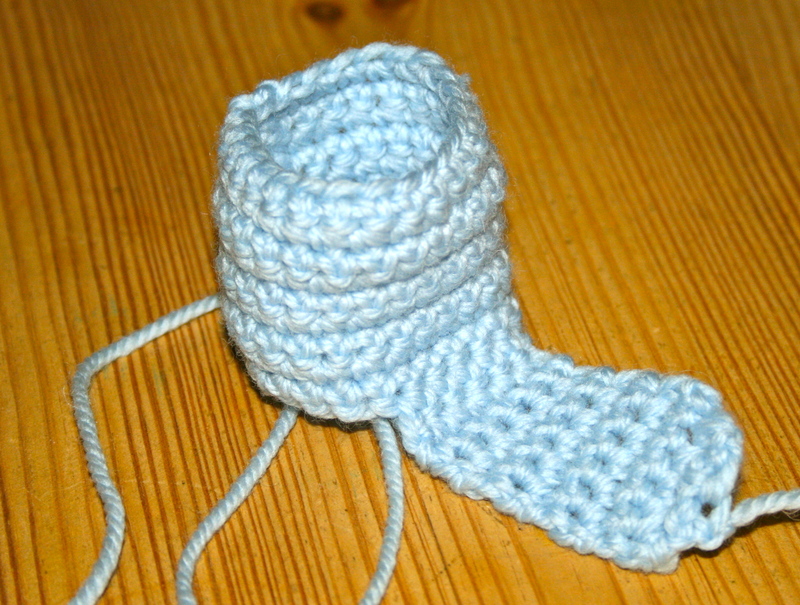 I imagine since babies often like to grab their toes, this would add something for them to grab onto and play with 🙂 What size would you say you made this in? Newborn? 3 months? I would say they were 3 to 6 months. I loved making them too. Love these booties! I’m intrigued by the white design in the background. Is it a bolster? What is the name of the pattern? Thanks for visiting, the white in the background is a cushion my daughter bought me, it is lovely but I regret to say I cannot take the credit for making it. Was it the pattern for the cushion you wanted or the booties? the cushion. I love the design. I am so sorry to say that it was a present so I do not have the pattern. I could send you a better photo if you think you could work it out. Let me know your email address if you want some close up photos. ty – for your generous offer of close-ups, but I will work it out from the pic you have. That way I can come up with my own version – or not . . . . will most definitely have fun trying! Cute boots, I want some! Can you make them in adult sizes? Thank you for your comment, to be honest I have not tried making them in adult sizes but I am sure it is possible. Thanks for the idea. Thank you for your kind comment, you could always use them as a car mascot, I think they would look cute hanging from the mirror! 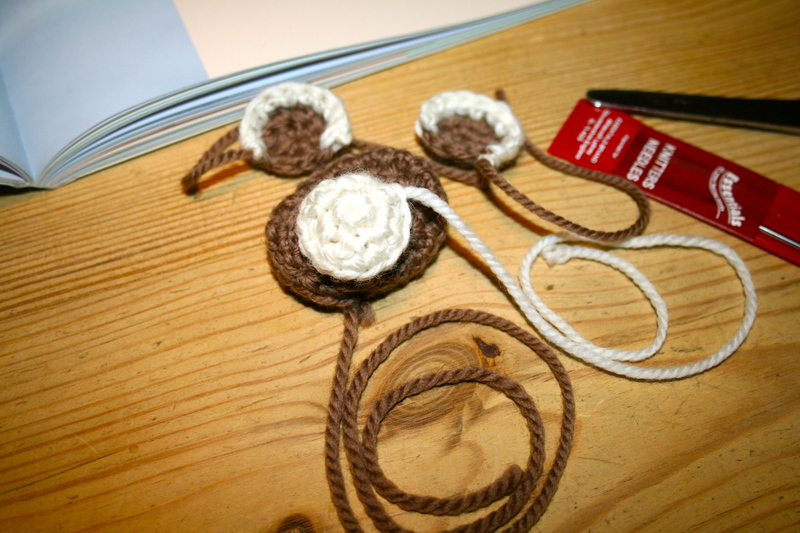 So cute, I love these… now who could I make them for? I have started the Teddy Bear in Pink, just because I love it so much. Don’t have anyone as a recipient yet so why not just go for it and make them they are so much fun. Thank you Hazel, I have to pass the credit onto Lois Daykin for this lovely pattern. How is your knitting doing?